Though she grew up around the language, Cynthia Jensen-Fisk never learned to speak Gitsenimx. She never even knew that learning it was an option. Jensen-Fisk is now learning the language from her aunt, Barbara Harris, as part of the master-apprentice program through the First Peoples’ Cultural Council. A First Nations-run corporation, the council’s mandate is to support the revitalization of Aboriginal language, arts and culture in B.C. The council does this through documentation, cultural programming, curriculum development and programs like the master-apprentice program. 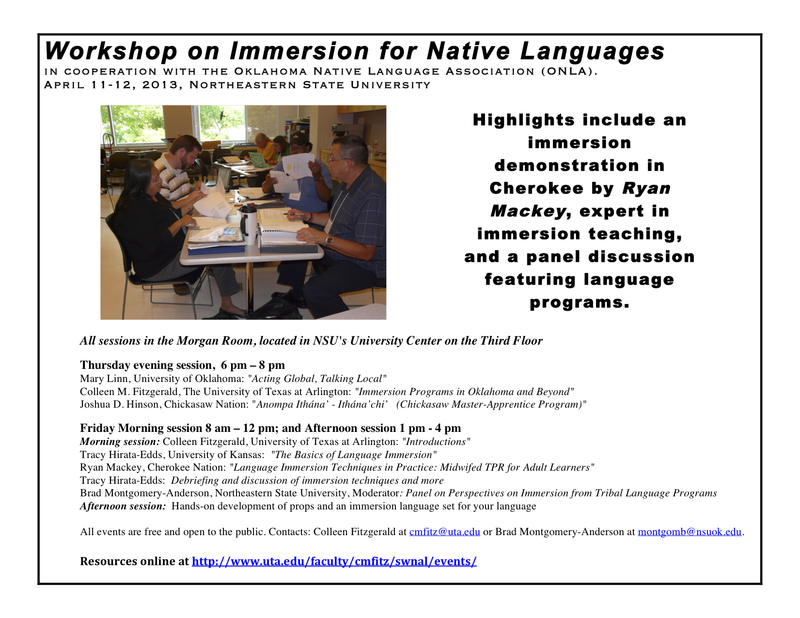 This weekend, Northern Arizona University will host an international conference on stabilizing indigenous languages. Language experts estimate that hundreds - if not thousands - of native languages have been lost worldwide over the last century, mainly due to the influence of outside cultures and ideologies. Jon Reyhner teaches bi-lingual multicultural education at NAU. He spoke with Arizona Public Radio's Gillian Ferris about what it means to stabilize these languages. Did you know that every 14 days a language is lost forever? The new Language Conservancy website is looking to change that by providing Native and non-Native people resources to help them take action and make a difference in their communities and around the world. The site gives visitors various ways to get involved ranging from teaching a language to becoming someone who raises awareness or funds. Vision Maker Media helped fund the site through its funding ofRising Voices--a documentary about the about the crisis of endangered Native languages that shows some of the solutions communities are coming up with to help save Native languages. There's still time to join us this summer! Nearly 100 Indian languages i8n Mexico and Central America are facing extinction. In an attempt to keep them alive, teachers are coming up with new means of documenting the languages and passing them on to the younger generation. “I went back to my village and continued speaking Zapoteco. I’ve always thought that language is a means of exerting power”, says Ernesto Hernández Andrade. He decided to keep his mother tongue alive despite having left his community at the age of 11. Hernández is doing a Ph.D. in linguistics at the Centre for Research and Advanced Studies in Social Anthropology (CIESAS) in the Mexican state of Chiapas. In his free time, he teaches students in his community how to write their native language, Zapoteco. The language is spoken in the northern part of Oaxaca and the state of Veracruz. According to the linguist, “the number of speakers is falling, as is the case for other Indian languages”. “Some adults don’t teach their children their indigenous language because they don’t want them to experience the same discrimination they did”, explains Hernández Andrade. Javier López, the director of the National Institute of Indigenous Languages (INALI), agrees: “even though indigenous languages and Spanish are equal in legal terms, a lot of work still needs to be done to achieve that in the public and private domain”. López Sánchez believes speaking one’s own language is a fundamental human right and says there needs to be “an integrated development plan for indigenous peoples in terms of the economy, politics, culture and language”. Research indicates there are 32 languages dying out in Central America because they’re only spoken by the elderly and another 50 languages are in a vulnerable state. In Mexico there are 64 languages “at high risk of disappearing. For the project, native people have been trained in documentation or linguistics so that the information can be used not only by the academic world but also indigenous peoples. “The native specialists have a stronger connection with the community and are less likely to abandon the project”, says Mateo. More than 300 hours of traditional uses have been recorded on tape, 50 hours on video, 100 hours in transcribed and translated texts and three books. Efforts are now being made to obtain additional funding to study another variation of Q’anjob’al in the Guatemalan village of San Juan Ixcoy. Talking Games is a 3D video game that makes language learning fun, but I need your help to fund the complete game engine. Support us to make this game which will benefit ALL languages and will revolutionize the way languages are taught, both indigenous and major languages. Please spread the word about our project and SHARE this link with your Facebook friends or on twitter and blogs. For $99 you can prepay for the full course (either Cherokee or Spanish), and if we don't reach our financial goal your money will be refunded to your credit card. If he went in search of a lifestyle completely different from the privileged one he experienced growing up in Chestnut Hill, with romanticized visions of Indian life swirling in his head, the reality of living for 13 years on the Pine Ridge Reservation in South Dakota has washed away those fancies as if they were sediment upon the looking glass. But at the same time, it has transformed those idealistic visions into practical applications and revised perspectives. What Chestnut Hill native and 1996 Chestnut Hill Academy graduate Peter Hill, 34, discovered is a people still fighting to rise from the unspeakable atrocities committed against them by the U.S. government. As a teenager, Hill visited the Pine Ridge Reservation during a series of summer work trips organized by the Church of St. Martin-in-the-Fields, the Episcopal church his family attended regularly. And after Peter graduated from Carleton College in Minnesota in 2000 with a B.A. in Native American Studies, he moved to the Pine Ridge Reservation through an international teachers’ program. He has lived there ever since, working as a history and language teacher at the reservation’s high school, Red Cloud Indian School. Yellowknife, NWT - March means it is time to celebrate aboriginal languages month once again. Its purpose is to raise awareness and celebrate the importance of keeping aboriginal languages alive. ALBUQUERQUE, N.M. (AP) — Efforts aimed at preservation of Native American languages would continue with the help of federal funding under legislation introduced by New Mexico Congressman Ben Ray Lujan. The New Mexico Democrat says his bill would reauthorize the Esther Martinez Native Languages Preservation Act for another five years.